Winter fruits are my everything. And I swear that they were put on Earth to give us something bright and happy and delicious in the deep dark depths of freezing cold winter. BUT I can’t even complain about winter right now because I just looked at the 10-day forecast and it is allegedly, going to be above 40 degrees for the next 10 days. In Boston! In February! With, I swear I’m not joking, weather in the mid-60s later this week. While a part of me is a little bit frightened (hi, global warming), I’m also pretty thrilled to feel some warmth and to not have my feet go numb while waiting for the train in the morning. Not that I’m putting my huge down coat away any time soon… This isn’t my first New England rodeo and I’m still fully prepared for March to be a hot (cold?) mess of weather. But for now, I’ll enjoy it, while I also hoard all the winter fruit that I can, just in case winter really is coming to an end. I just have to make note of the fact that I absolutely hate myself when I talk about weather on my blog (two things that always seem to be on my mind are weather and how tired I am… And I know you’re probably not interested in hearing about either of those items! ), but I feel like I could make an exception for today because 65 degrees! In February! In Boston! But also because I needed to warn you to start stocking up on blood oranges, pomegranates, grapefruits, and more. It’s my civic duty. Though I have to say that I’ve had a really rough time actually finding pomegranates at all this season… I keep thinking there must be a shortage, but I haven’t heard any news of one. Thank goodness for Pom Wonderful’s arils and juice. 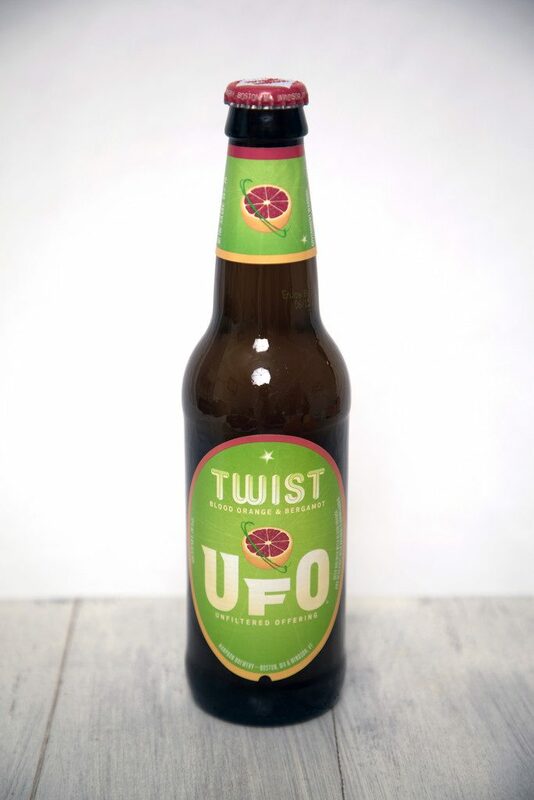 And UFO’s Blood Orange and Bergamot Beer, obviously. Mussels are also most in season during the winter months, so you can just consider this dish the perfect dose of winter happiness. Bright happy colors, shellfish, and pasta. Who even cares what the weather is like outside when this is in front of you? I feel like mussels are seriously underrated and I’m constantly confused as to a) why they’re so freaking cheap and b) why people don’t make them at home more often? Also, c) why I never think to make them when I have company. They’re easy and fun and fancy feeling. 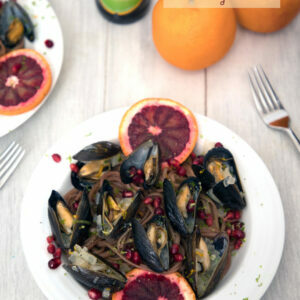 Plus, you can do prepare mussels a million different ways. I mostly always use some kind of beer. Oooh la la hiii. Believe it or not, there are tons of blood orange beers on the market. I used this UFO Blood Orange Bergamot Beer, but also recently discovered Dogfish Head’s Flesh & Blood and omg it’s sooo good. If you can’t find a blood orange beer (I FEEL SAD FOR YOU), I recommend using an IPA. The UFO is a hefeweizen, which is a nice light and crisp choice for mussels, but without the blood orange, it may be a little more summery than you want for February. Then again, it might be exactly what you need. If you can’t find blood oranges, you need to keep hunting! My grocery store literally has 20 different variety of oranges and the Moros (the technical name for blood oranges, I guess) were tucked away on a little shelf above some other oranges. The lady standing next to me was flabbergasted by all of the oranges and then started freaking out about “Moro?? What’s a Moro?? How do I know what kind of orange to get? ?” I kind of felt her pain, but also no, because you should know that when blood oranges are in season, you always buy them. Don’t worry, I schooled her… But I also think I scared her away. People in this town just don’t get me. Back to the mussels. This dish just made me so happy. 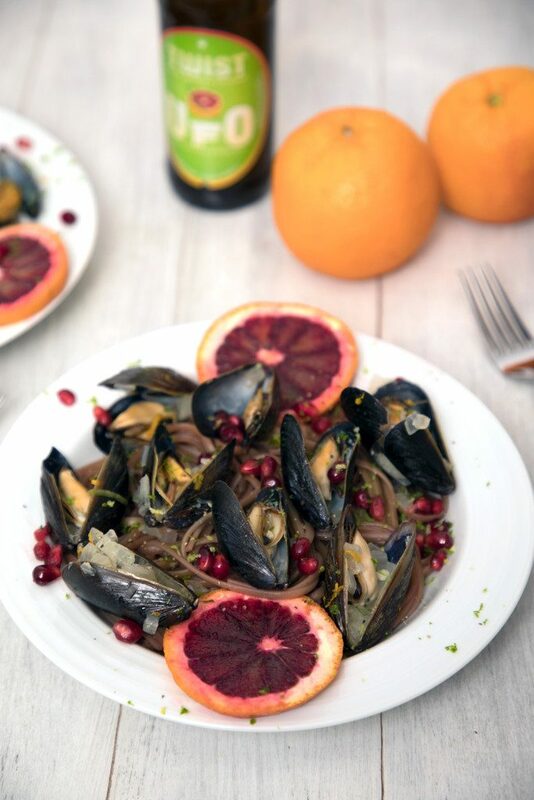 While I think mussels make a great appetizer or a fabulous meal served with french fries (AKA heaven), I also love serving them over pasta for a nice hearty winter meal. I used a plain linguine here, but I tossed it with pomegranate lime molasses (a recipe I repurposed from the Pom Wonderful cookbook that I blogged about a couple years ago) for an added depth of flavor. I highly recommend doing that. And also keeping a jar of the molasses in your fridge. I obviously bought Pom Wonderful pomegranate juice for the molasses (I mean, have you ever extracted juice from a pomegranate? ), but then because I also bought Pom Wonderful’s arils because I legit have not seen pomegranates in my grocery store all winter long. I admit that it’s kind of nice not to have to open the pomegranate myself, but I also find something kind of relaxing and peaceful about opening pomegranates. So long as I don’t turn my kitchen into a red-stained disaster, it’s a kind of stress relief. I know it’s probably kind of silly to serve mussels in their shells over pasta, but isn’t it just so pretty? I think mussels are one of the most gorgeous foods… Which is probs totally strange to say about a shellfish. A mollusk. But oh well. Since this beer comes in a 6-pack and you only need two for this dish, that means you’ll conveniently have some leftover for sipping while you indulge. 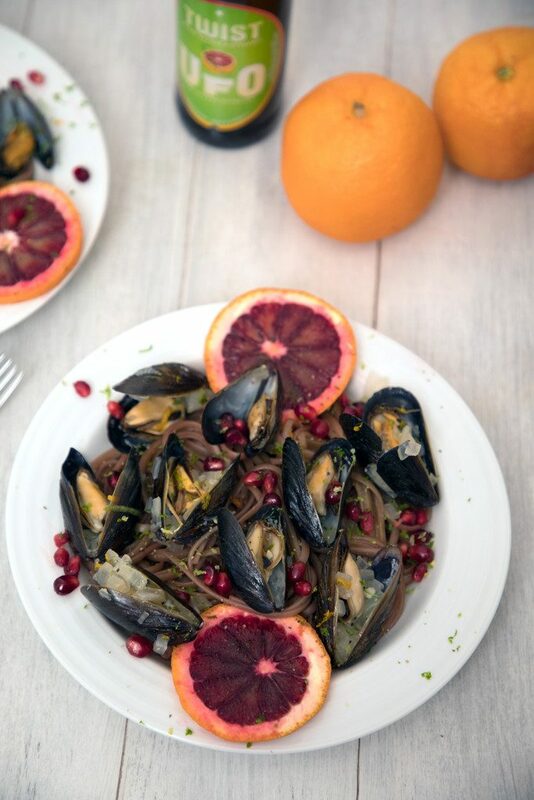 I just love that this is technically a winter dish with the mussels, blood oranges, and pomegranates; but that all of the light crisp citrus and pretty colors make it so bright and summery. You know, it’s kind of like 65 degree weather in February. 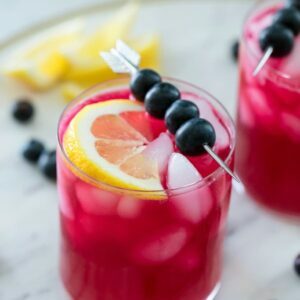 Are you a winter fruit lover? 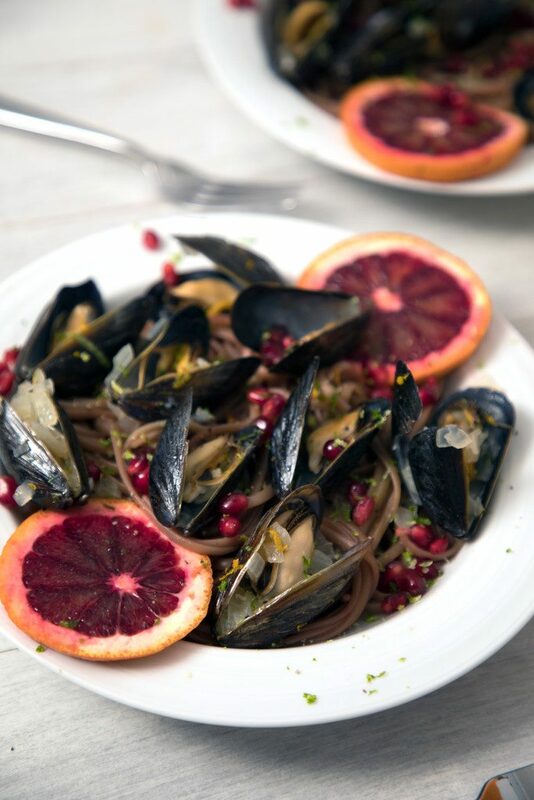 Blood oranges, pomegranates, and lime combine with mussels and linguine for a dish that brings a bright and fresh feel to winter! Add onion and garlic and sauté until onion softens, about 2 to 3 minutes. Add the blood orange beer to the saucepan and bring mixture to a boil. Then reduce to a simmer and add the mussels to the pot. Cover pot and let the mussels cook until the shells open, about 4 to 6 minutes. Add 2 Tbsp butter, blood orange zest, and lime zest to the pot and stir to combine, reserving a little bit of the orange and lime zest for garnish. 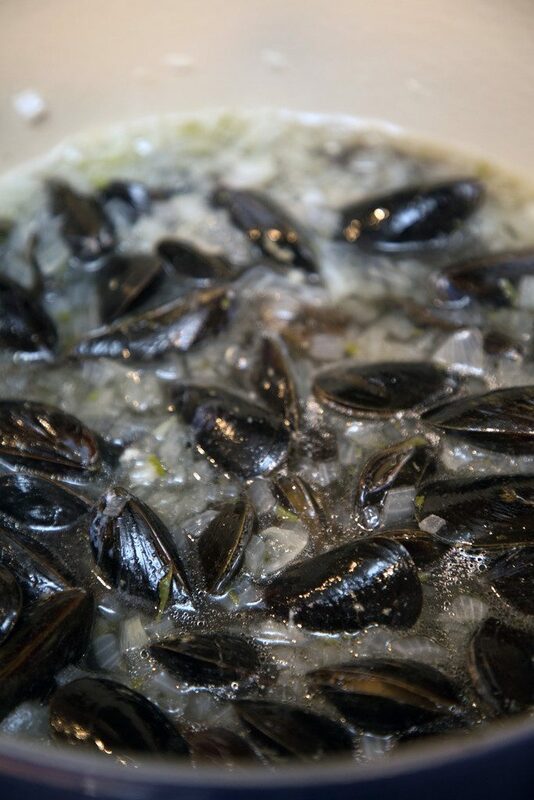 Transfer mussels with a slotted spoon to a separate bowl, discarding any mussels that didn't open. Spoon cooking liquid over the mussels. While the mussels are cooking, bring a pot of lightly salted water to a boil. Add linguine to pot and let pasta cook until al dente. Drain pasta and return to pot with 1 Tbsp butter and pomegranate molasses. Stir well to combine. 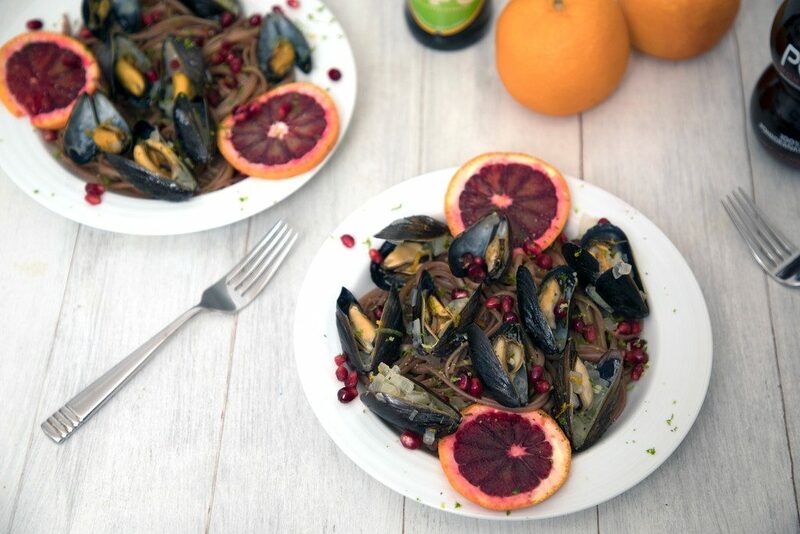 Serve linguine in bowls and top with mussels, some of the cooking liquid, pomegranate arils, blood orange slices, and additional zest. Combine pomegranate juice with sugar and lime juice in a medium saucepan and bring to a simmer. Reduce the mixture until a very thick syrup forms, about 20 minutes. The mixture should coat the back of a spoon. 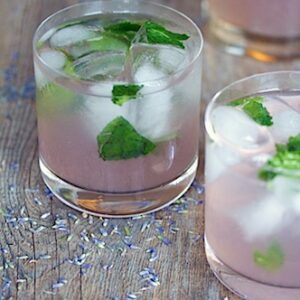 Pour into a mason jar or bowl to cool to room temperature. 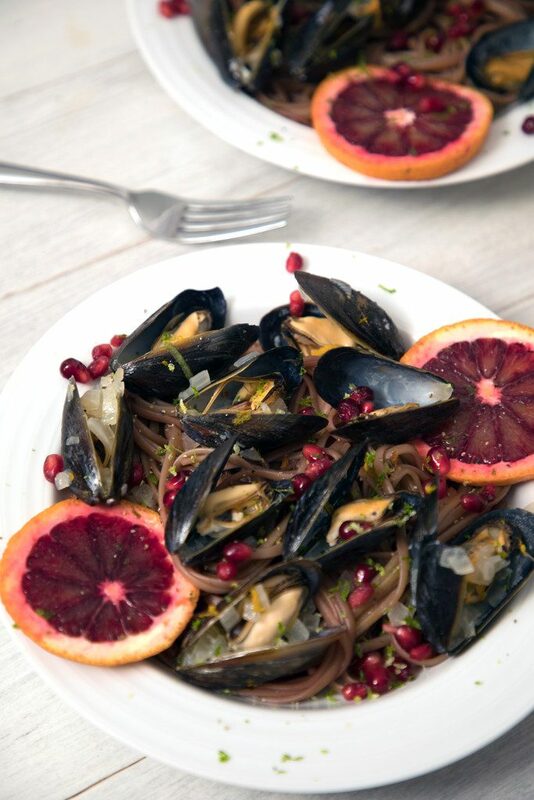 10 Responses to "Blood Orange Mussels with Pomegranate Lime Linguine"
Yum! 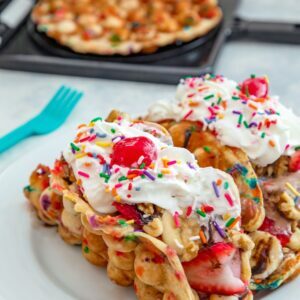 This whole combination looks delish! I just love blood oranges! That colour!! And you should feel sad for me because I haven’t seen a blood orange beer around here 🙁 I tend to talk about the weather a lot too ’cause how can you not, right? And, I’m pretty much tired 99% of the time. But this? This dish would certainly perk me up! I’ve never had a combo like this before. And I haven’t had mussels in so long so now I think it’s time! OMG the dogfish blood orange beer is AMAZING. And i always ask myself the same questions about mussels! 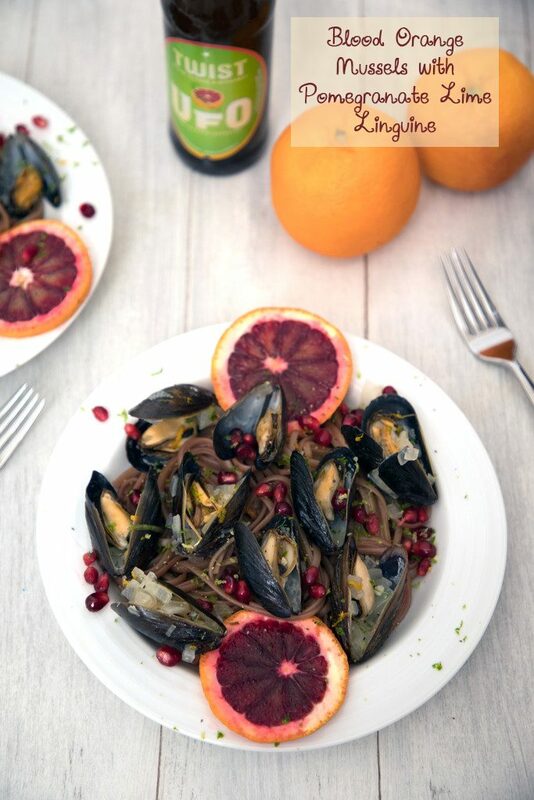 Love this post, Mussels meals is my favourite food for spring! I’ve never seen that beer! I need to get on that! 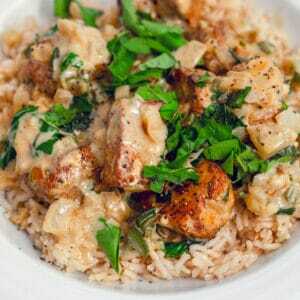 But this is a meal my hubby would LOVE! Thanks for sharing!! Isn’t this weather crazy?! It was around 70 yesterday here in Chicago, right now it’s 40, and on Saturday, back to reality in the 30s. Hard to believe it’s still February right now! This is such a fun and creative dish, Sues! I love blood oranges, so I can only imagine how delicious this must be. And that linguine is calling my name! YUM! I am intrigued by that beer! I never knew winter was mussell season. I usually buy frozen. I will keep this in mind and look for fresh ones in winter. Sadly we don’t get blood oranges here. Absolutely addicted to winter fruits over here too. My father-in-law was just asking me about making some mussels for family dinner, these sound amazing! !